I was on a recent trip to Hampi with my wife and son and, well, could not pass up the opportunity to visit the Daroji Bear Sanctuary. 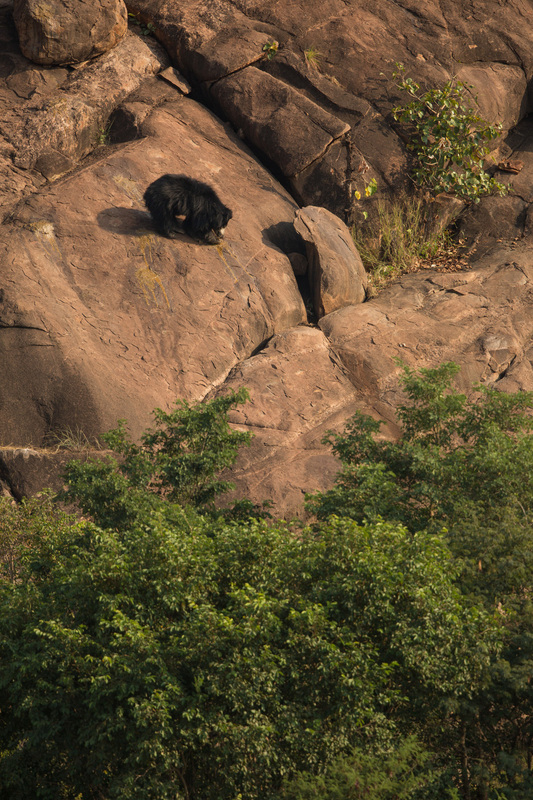 It does not have safaris, but you stand atop of a rocky outcrop looking over the boulder strewn forest that is the sanctuary, hoping to glimpse a sloth bear. We got lucky and saw three bears and a short-toed snake eagle swoop by with dinner! It's only when you look closely that you can see the bears roaming around the boulders. A couple of bears leave their cave and wander down the hillside into the forest. Like everywhere, you can't just be focused on what's in front of you and keep an eye out for what else is happening in a scene... this time, the eagle made it easy by practically flying right in my line of sight!